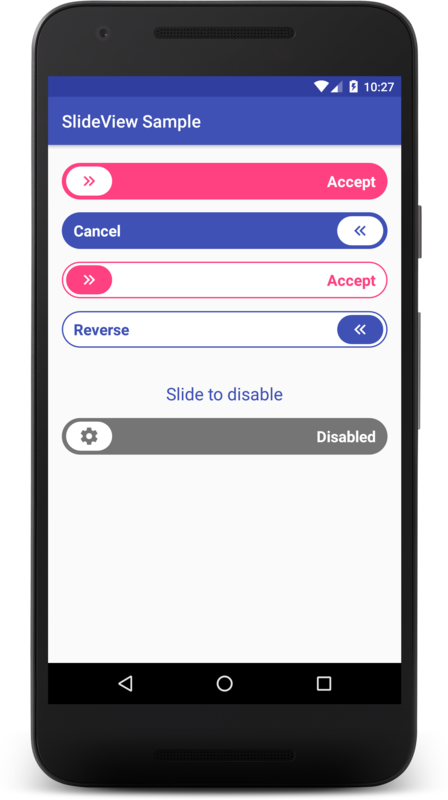 A simple, yet awesome sliding button for Android. The SlideView is very easy to use. Just add it to your layout like any other view. From version 1.1.0, all SlideView's attributes are prefixed "sv_", this is to avoid conflicting with attributes in other libraries or attributes defined by users. Here's an example with all the view attributes. Note: All color attributes can be replaced with a ColorStateList so the SlideView can use the appropriate colors for the enabled and disabled states. See the sample module for examples. You can set a listener to be notified when the user slides across the SlideView. An example is shown below. For convenience, many of the SlideView attributes can be set via code. The view height is currently fixed so you should use wrap_content when defining the view height in your layout. If you find any bugs, please feel free to fix it and send a pull request or open an issue.